U.S. and European forces have battled before on a Michigan golf course. And for those keeping score, the leaderboard reads like this: Euros 1, U.S. 0. 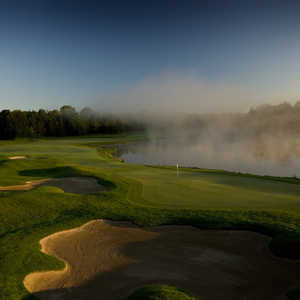 Way back in 1814, 190 years before this fall's Ryder Cup clash at Oakland Hills Country Club in Bloomfield Hills, Mich., the United States and British fought a bloody battle on the ground that is now Wawashkamo Golf Club. The club is on Michigan's historic Mackinac Island, a state and national historic site that is also the Great Lake state's oldest continuously played golf facility - dating back to 1898. The Americans lost that battle, which has been all but forgotten by historians, a botched attempt to retake Mackinac Island from British control after the War of 1812. But a golf purist would say the Americans eventually won the war, as the land is now a cute little throwback course to golf's Scottish roots, packed with golf (and military) history. In fact, if you slice your drive on the fifth hole, you'll end up on Holmes Hills, where at least 10 U.S. soldiers are buried. U.S. troops tried to attack heavily fortified Fort Mackinac from behind but were met by waiting British and Menominee Indian fighters somewhere near Wawashkamo's eighth tee. Several dozen American soldiers were killed, including Maj. Andrew Hunter Holmes. The rest of the invading forces quickly retreated to the beach. Many of the slain Americans were buried between Wawashkamo's fifth and sixth fairways on the mound now known as Holmes Hill. "This course, this whole island, is all about history," said Wawashkamo golf professional Fred "Fritz" George. Hint: If all of this history means nothing or does nothing for you, DO NOT play this course. 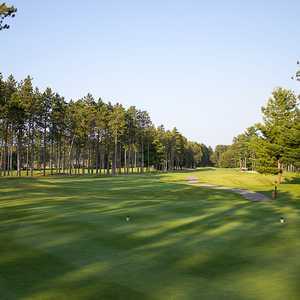 An appreciation of history is essential for playing Wawashkamo because it is 180 degrees different from all of the plush resort courses of northern Michigan. Be forewarned, Wawashkamo is not plush, it is not fancy and it registers a zero on the modern-day golf snob's "wow!" meter. By modern golf course standards, it's laughable. But it's dripping with historical nuances that make it a one time must-play for those with an appreciation for the history of the game. The course appears to be 18 holes on the scorecard but it is really only nine holes, with different tees for the "back nine." The first hole runs along what becomes British Landing Road and there is a bucket of sand next to the tee, which allows you to build a small sandhill to drive the ball off, the way they used to do it before the invention of the tee. After a few holes, you'll realize that this course has not changed one iota since Scotland's Alex Smith, a two-time U.S. Open winner, designed a course like the ones he knew back home. The greens and tees are watered, but the fairways are kept bone dry. "I had to take a horse-and-buggy ride to get to the course, so I should have known it was going to be something different," said self-proclaimed golf nut Pat Kirk of Naples, Fla., who now knows all motorized vehicles are forbidden on the four-square-mile island. "It's a course that fits with its location on Mackinac Island. I wouldn't bother to play it anywhere else." The course's name itself is historic. As legend has it, Chippewa Chief Eagle Eye observed that the golfers "Wa-wash-kamo" - which means walk a crooked path - and the name stuck. In terms of a course review, there's not a whole lot to say. The greens are small, the tees are tiny. Surprisingly, power carts are available, but if you're ever going to walk a course, this is it. The best way to play the course is with hickory-shafted clubs, with 11 sets available for rental. The course hosts one of the country's largest "hickory sticks" tournaments every August, with the men in knickers, collared shirts and ties, and the women in full-sleeved dresses and broad-brimmed hats. The best stretch of the course begins on the "signature hole," if you will, the 336-yard, par-4 third hole. It's probably the only time in your life that you will encounter a "circus ring" around the green, a two-foot high mound circling the putting surface, producing an island green - sans the water. The short, par-3 fourth hole slopes violently to the right, sucking balls into one of the many pot bunkers, cross bunkers and trenches that offer challenges most Americans only watch once a year during the British Open. History takes over on the fifth and sixth holes, just knowing that a burial ground is located directly between the fairways. This was also the point where I tired of my brassie (2-wood), mashie (5-iron) and niblick (8-iron), and would have given my left arm for my Ping irons and Taylor Made driver, sitting idly in my trunk on the Michigan mainland in Mackinaw City. Club members, of which there are only 125, note the most critical portion of the course is the back-to-back long par-3s of No. 7 (219 yards) and No. 8 (224 yards). Both holes feature "chocolate drops," boulders which were too heavy and expensive to remove, so were left as hazards and are now covered by wild grass. I'd challenge any pro, equipped with a mashie, to par these two in a row, let alone this 10-handicapper. When you're done, have a lemonade and get ready for the horse-drawn carriage ride back to the main part of the island. Between the clippity-clop and the ploppity-plop, leave your golf snobbiness behind. Wawashkamo, perhaps more than any other course, demands the right attitude. Come out expecting modern golf grandeur and you'll storm off after two holes. Come out with an appreciation of the soul of the game and a little interest in the military history that you undoubtedly missed in high school and you might not want to leave. 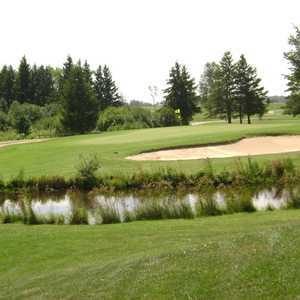 Wawashkamo Golf Club is the perfect venue for anyone who wants to get into the spirit of the Ryder Cup or have a throwback golf experience. If that's what you're after, book a trip up to Michigan's Mackinac Island. If you're seeking a deluxe golf course and a resort-type experience, better look elsewhere. The only resort on historic Mackinac Island is Mission Point Resort, which features a nationally rated Kids Club. Horse-drawn carriage taxis are available at Mission Point to bring guests to anywhere on the island, including Wawashkamo. For more information, go to missionpoint.com or call (800) 833-7711. Wawashkamo is located on the north side of the island and far away from the many restaurants and bars on Mackinac's "main street." Motorized vehicles are prohibited on Mackinac Island. The course is more than one mile from the many cottages and bed-and-breakfasts on the island, so you'll have to take a horse-and-carriage to the course.